Disney is a growth position I want to add to my portfolio. The yield is terrible but the growth prospects are very attractive. One might ask where is the oil purchases this week? I am willing to wait it out further. I have a feeling the selling will continue towards the end of this year as people and institutions sell for tax harvesting benefits. WTI doesn't seem to have a positive trend yet either so the downward spiral seems to continue. Oil can easily tumble down for 6 months at a time. 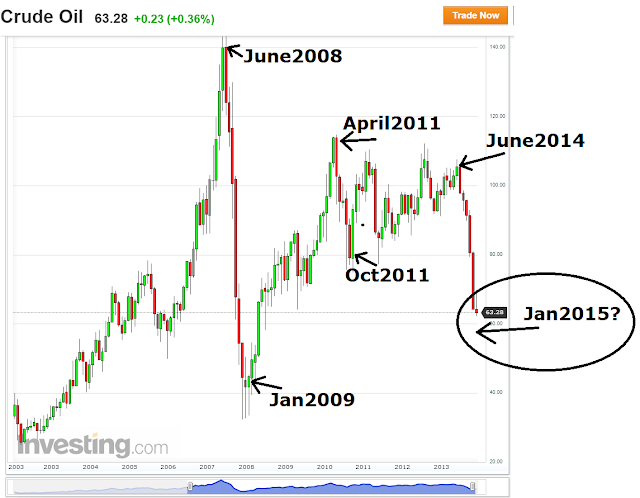 On June 2008 during the financial crisis, oil tumbled from its max in June and rallied back at the start of the new year. Will this same behavior continue in January 2015? Studying charts might be a fools game... I am happy to own high quality companies such as CVX and XOM during the hard times when they are cheap.